I’ve been treated to many delicious meals during our visit in SA, of which this pear salad is one. My good friend Colette, whipped this up one hot afternoon after coming back from our “hunt for all things old”. Wash and cut the pears into eight parts. Heat some butter with a spoonful of sugar in a pan, add the pears and sauté over high heat until nicely caramelized. Deglaze the pan with some white balsamic vinegar, lemon juice and a pinch of salt. 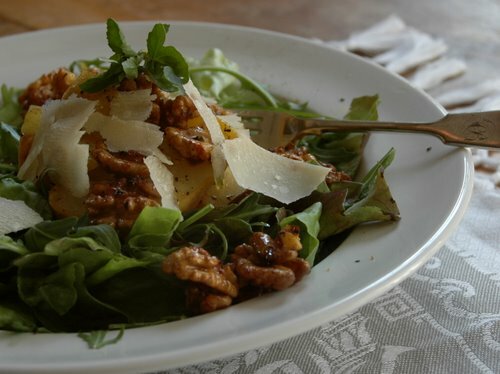 Arrange the salad leaves on 2 plates, spoon the hot pears on the salad and sprinkle the walnuts. Spoon the deglazed pansauce over the salad and finish off with some shaved parmesan cheese, a drizzle of olive oil and a sprinkling of pepper. For a more substantial meal: Add some crisp fried parma ham/bacon, or goats cheese, or some flaked white fish to the salad. 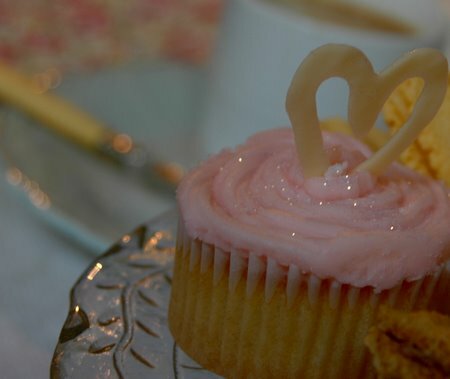 Finish off this late afternoon meal, much later, with tea and a freshly baked cupcake that you’ve bought on your way home at the sweet deli just around the corner. Previous Article I’m holidaying in SA. Welcome back! I love pear salads, and yours looks wonderful. White balsamic? I will have to look for that one. Secondly, this pear salad looks simple and lovely… I’ll have to try it out some time! Lovely! And I adore white balsamic vinegar… so perfect for apples and pears! So glad to see you back and posting again! I missed you. Ahhh! the sort of food that I should be eating!.. Lovely stuff. My goodness, what a beautiful salad! Deglazed pan sauce as the dressing. Fabulous! I love the idea of cooking the pears, rather than raw. The components of this salad are masterful! Oh my this is one DELICIOUS salad! Oh how delightful! I love pears but somehow they never make it into my salads. Silly, because when I was in Italy last month we had The Best Salad In The World – green leaves, pear slices, Parmiggiano chunks and prosciutto slices with walnuts – divine! Do you know Parsienne ‘Colette salad’ with grapefruit, lettuce hearts and avocado?